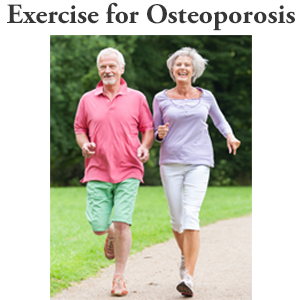 This blog article will cover two effective osteoporosis back exercises that are part of the Exercise for Better Bones program. 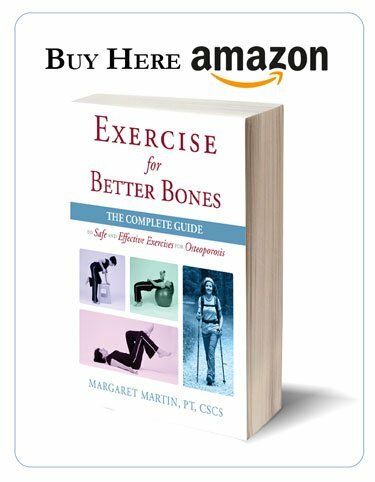 If both of these osteoporosis back exercises are two advanced for you and you want to gradually build up to do them, I recommend that you first master the Straight Arm Dumbbell Floor Pullovers. Let’s start with the Swiss Ball Pullover with Single Dumbbell for Athletic Level. 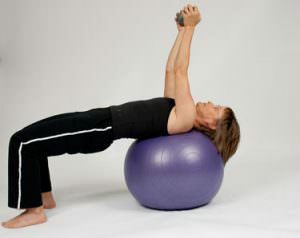 The Swiss ball pullover with single dumbbell is an Athletic level Exercise for Better Bones osteoporosis exercise. 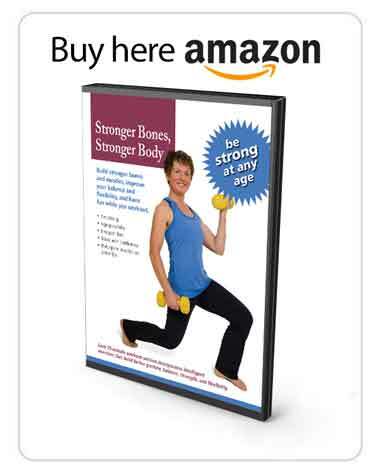 This osteoporosis back exercise is designed to strengthen muscles in the back, hips and spinal extensors. 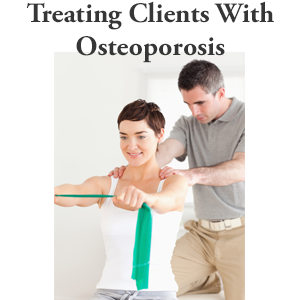 It is also targeted at bones in the spine, hips and wrists. I demonstrate the exercise in the video. The following are the instructions to follow to execute the swiss ball pullover with single dumbbell. Whenever you start using weights on the ball, you want to ensure that that ball is there for you. Hand position: make sure the ball is there so you can sit onto the ball. If you want more detailed instructions on safely getting down onto the ball, please refer to the exercise safety tips, otherwise, remember that the weight stays on your hips, or on your chest, and you drive your hips down towards the floor. Next position, lift up, weight comes straight up to the ceiling. Take your breath in, weight returns right over to your eyes. The weight I’m demonstrating with has a nice grip to it, but if you are using weights that are a little more slippery, please ensure that you wear your weight training gloves because the weight is straight overhead and you want to ensure a good grip. You come out of it, you can place the weight back to the floor, and just focus on your form when you’re coming back up. That’s it for the swiss ball pullover with single dumbbell for Athletic Level. 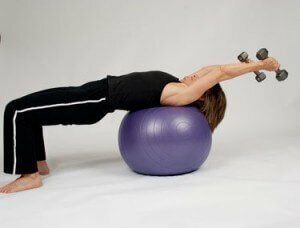 The Swiss ball pullover with two dumbbells is a strength exercise from the Exercise for Better Bones program specifically designed for the Elite Level. The exercise targets the hip abductor muscles. It also targets the bones in the wrist and hips. 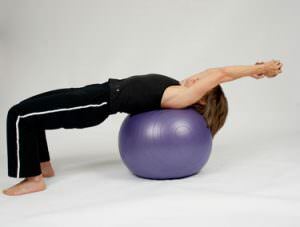 This exercise should only be done with the correct sized and safe burst resistant physio or exercise ball. The following are the instructions to follow to execute the Swiss ball pullover with two dumbbells. Ensure that the ball is where you need it to be. Safely get down onto the ball with the weights either resting on your thighs or your chest. When you feel the ball under your shoulder blades, raise your hips and drop your head. Most of the weight’s going to be through your upper shoulder blades. You’re going to bring the weight straight up overhead with your thumbs pointing back. Weights stay parallel to one another for the entire exercise. Keep your body in a nice table top position for the entire time. When you’ve done your set, return your weights back down and drop them safely to the floor. By dropping your hips first, you’re not putting any stress on your shoulders. And then you can focus on just getting back up yourself.